ThermoWood is an environmentally friendly, medium-cost alternative to traditional pressure impregnated wood. ThermoWood is also known as thermally modified wood. 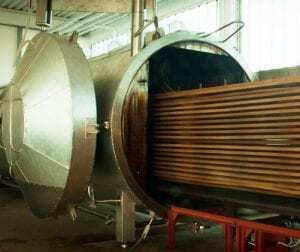 During the heat treatment, chemical and structural changes occur within the timber. These changes alter and improve some of its basic characteristics. These include improved timber stability, less risk of cracking and resistance to rot and fungi. The patented thermal modification process uses controlled high temperatures to dry the wood. There are no harmful chemicals used during the process so the timber offers no future harmful environmental impact. The ThermoWood colour can range from light brown to golden brown. Without any further treatment sunlight can turn the colour a silver grey in time. The colour penetrates all the way through the timber. This means it can be worked without any noticeable colour difference. The characteristics of ThermoWood make it most suitable in outdoor applications such as garden planters and outdoor furniture. You can view our range of thermally modified wooden products here. It is produced mainly using Scandinavian FSC/PEFC Redwood Pine or Whitewood/Spruce.